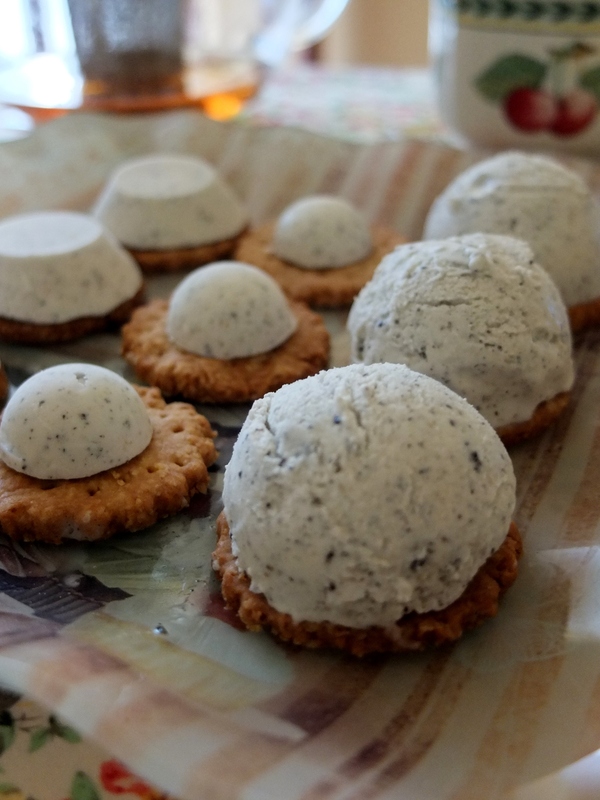 Black sesame and yuzu ice-cream petits fours biscuits! Sugar-free! Once upon a time in a delightful Japanese patisserie far far away (in London), a rather cake-obsessed person discovered black sesame cream puffs. The distinctive nutty creaminess led to a moment of revelation and swooning. 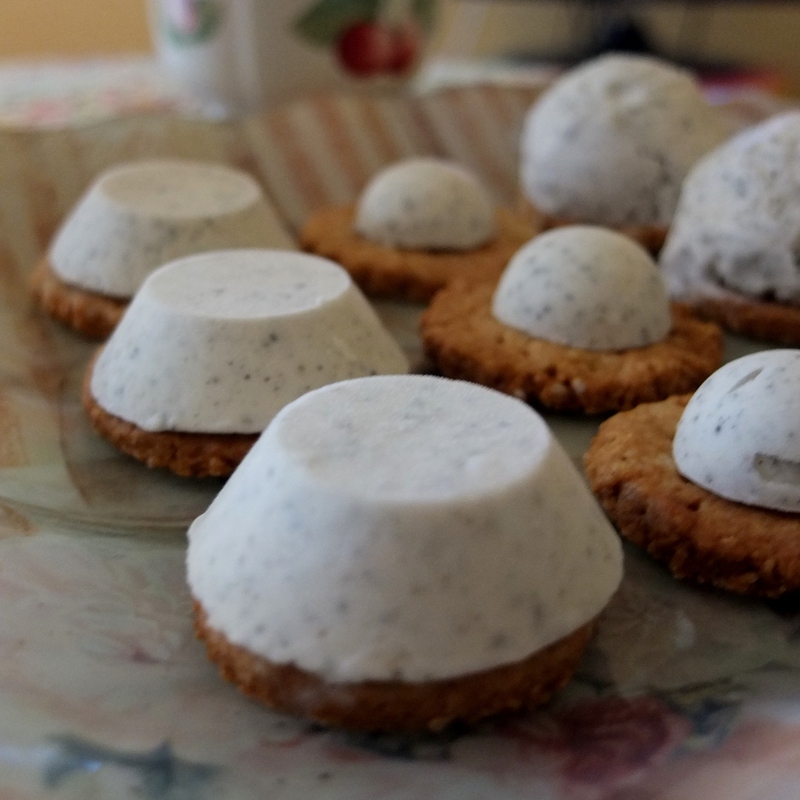 Months later that cake-obsessed person (yes, me) came across a black sesame ice-cream recipe in Bloglandia and sensed it would pair splendidly with healthy spelt digestive biscuits. The combination was tweaked to be lighter and sugar-free, with coconut cream, honey and yuzu. Et voilà mes ice-cream-eating amis: black sesame and yuzu ice-cream petits fours, delicious bite-sized treats combining sweet tangy and savoury nutty flavours. With a snappy drizzle of dark chocolate. Again, swoon. … Savory Sweet Living’s recipe for the interesting ice-cream. I just substituted coconut cream and honey for the milk, cream and sugar then added yuzu. 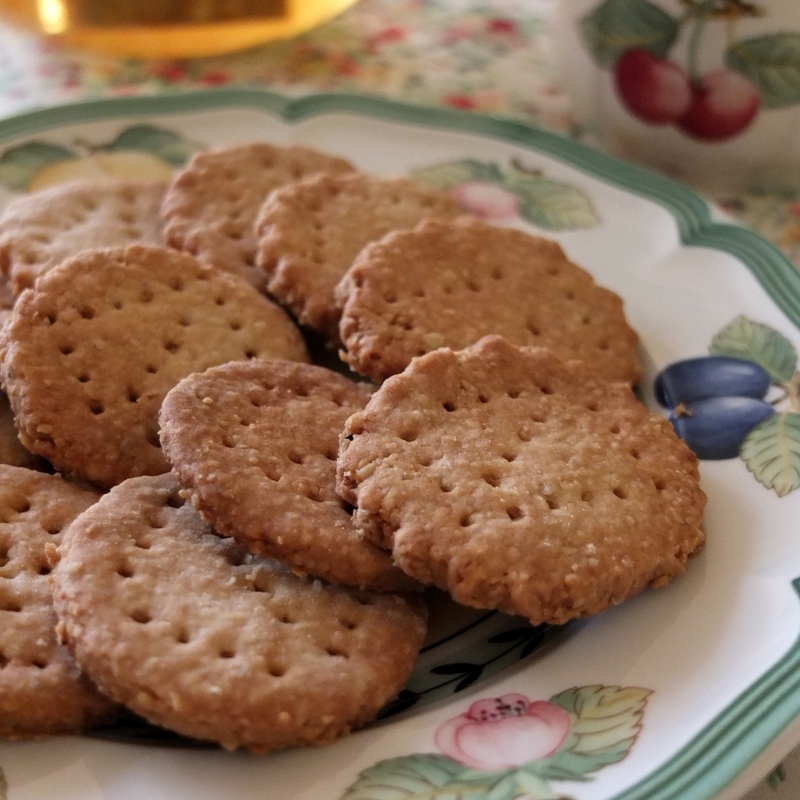 I’m also grateful to Sarah’s brilliant digestive biscuits recipe at Tales from the Kitchen Shed. I simply added slightly more salt. 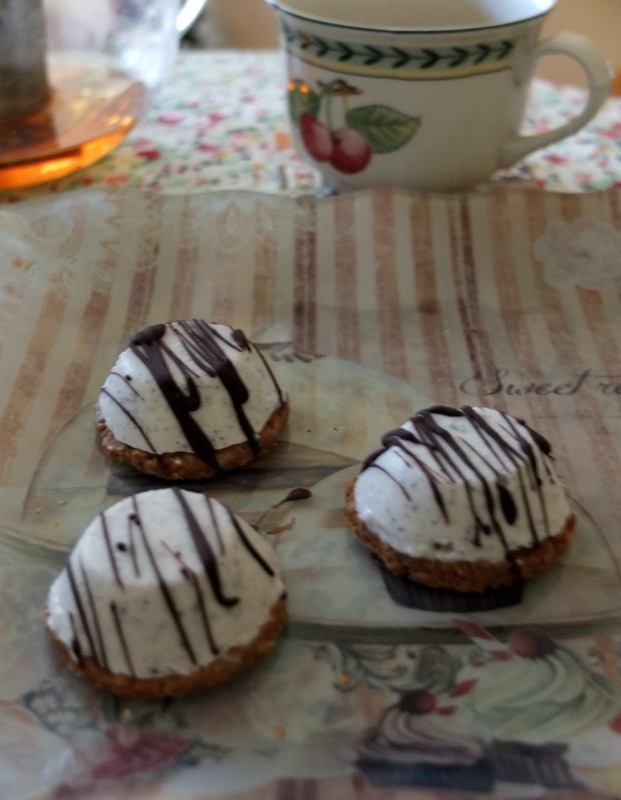 The petits fours are my little invention. I had silicone moulds for small half-domes or upside-down cups then a scooper for big balls. Choose your preferred size and shape (reducing or increasing biscuit sizes) according to your tastes and available moulds. 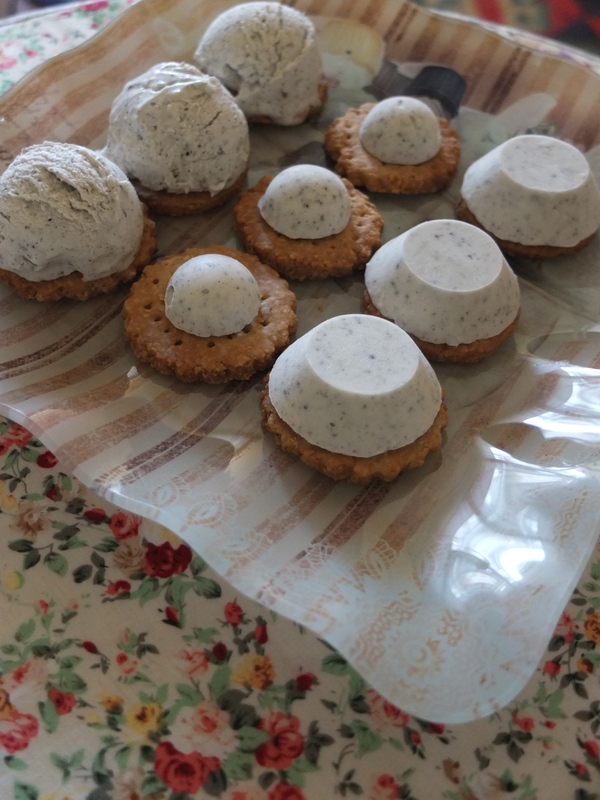 The medium-sized ones resulted in a great ice-cream to biscuit ratio for me and can be eaten with your hands as bite-sized petits fours. But you might prefer more ice-cream, with biscuit crumbled over it. Timings: make the ice-cream the previous day or start 7 hours before assembling (10 mins to make, 3 + 3 hours’ waiting). Start making the biscuits at least 2 or 3 hours before assembling (15-20 mins to make, 30 mins chilling and 12-15 mins baking – or buy a packet of digestive biscuits, aka graham crackers) Assemble and flick dark chocolate before serving (5-10 mins). So a total of 30-40 minutes work. Warm the 120g/half cup of coconut cream with the honey and salt and stir till the honey dissolves. Pour into a large bowl and whisk in the yuzu and larger quantity of coconut cream. Taste to check the flavour. Cover and leave this mixture to cool in the fridge for 3 hours minimum or overnight. Grind the roasted black sesame seeds in a bamix or spice grinder. Start your ice-cream machine churning as per your machine’s instructions then slowly pour the coconut cream mixture in. Gradually pour in the sesame seeds. Keep it churning. Mine needs about 20 minutes. When you have that nice creamy texture, pour into moulds or airtight tupperware containers and freeze 3 hours or overnight. Once set, unmould the shapes and store in airtight tupperware. Grind the oat flakes to oatmeal then in a large bowl whisk together all the dry ingredients. Rub the small pieces of cold butter in until the mixture is like breadcrumbs then quickly stir in the maple syrup with a fork. Place on a lightly floured surface and ‘fraiser’ very briefly with your palm to bring together and make a ball (see videos and details on my making shortcrust pastry page). Lightly cover in flour and wrap well in plastic film then let it rest in the fridge 30 minutes to an hour. Preheat the oven to 180°C/350°F (static, non-convection oven) or 160°C/320°F (fan-assisted). 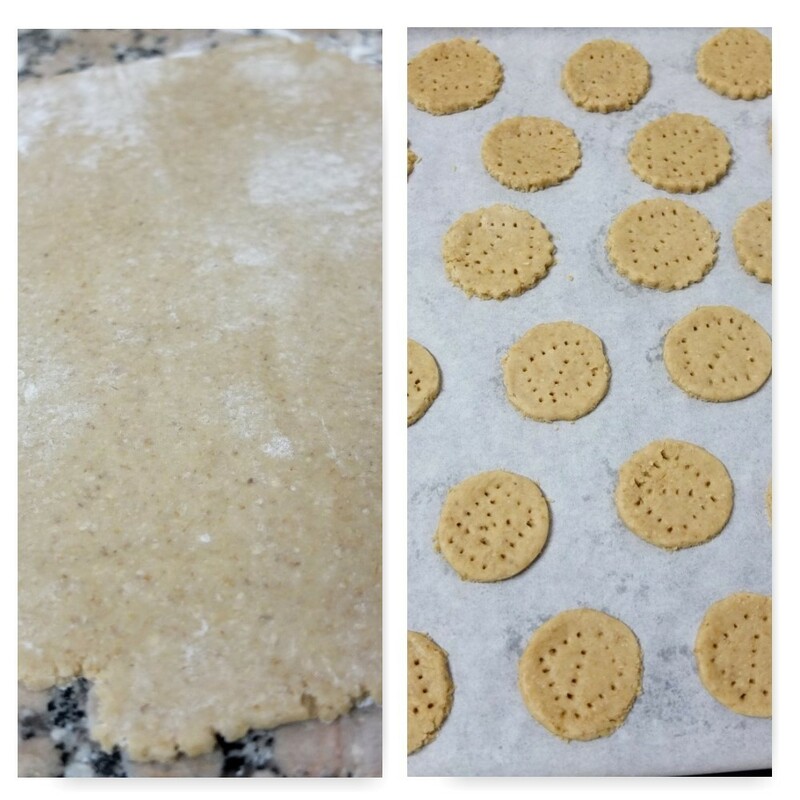 Roll out the pastry to 3-4mm thick then cut circles with your cutter or glass. I tried some with crinkly edges and others with straight edges and like both. Place on your baking tray a few cm apart. 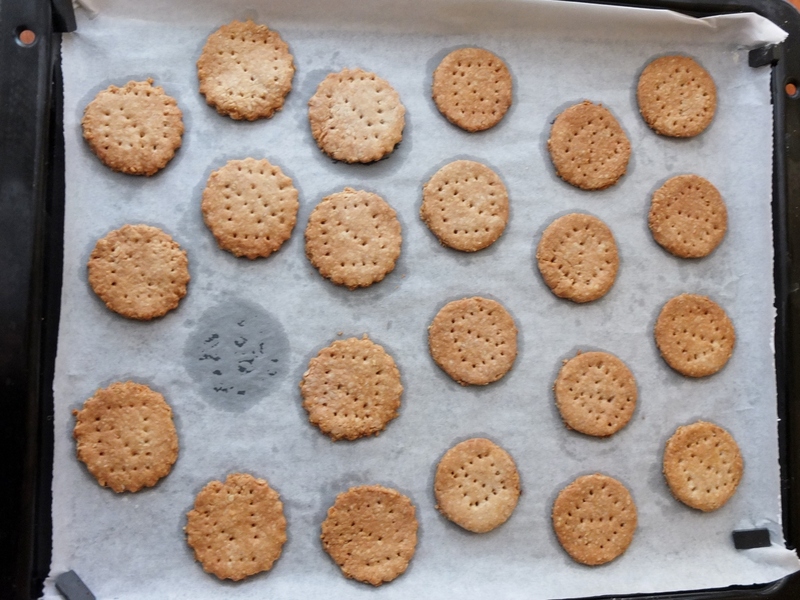 Prick with a fork, creating the same pattern on each biscuit to make them attractively uniform. Bake in the middle of the oven for 12-15 minutes till lightly browned. Biscuit no.1: Hey where’s Albert gone? Biscuit no.2: Oh dear, I think he’s been tested! about 100g dark good-quality 55-70% chocolate, depending on the number of biscuits and thickness of drizzle. Place an ice-cream shape or scoop on each biscuit. Melt the dark chocolate over a bain marie then flick a spoon of it to and fro very quickly over your biscuits. Practise beforehand over the bowl. I clearly need more practice but the biscuits do look more ‘dressed up’ now and ready to party. You can serve these treats straight away or even freeze them for a week or so. Allow to defrost around 15 to 20 minutes before eating, but not too much longer. 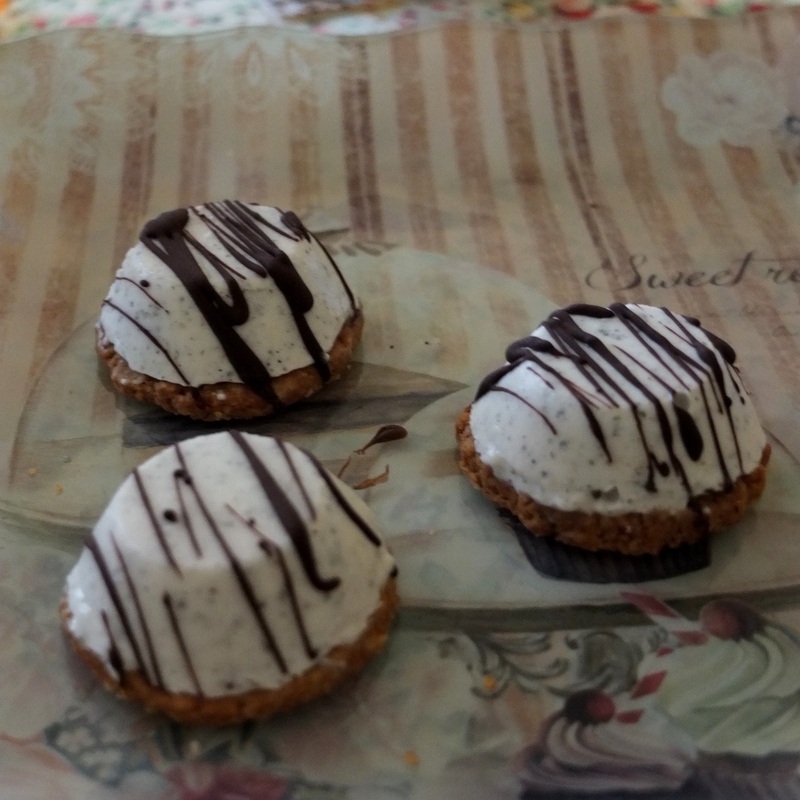 Have a little ice-cream petit four! And if you’re interested in the latest pâtisserie trends and experiments check out the Fou de pâtisserie magazine replete with inspiring recipes. 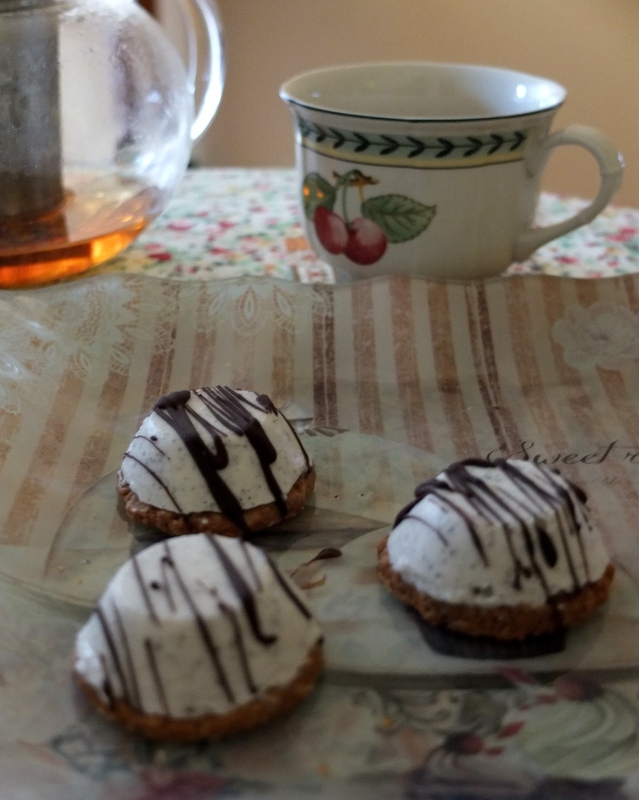 Do feel free to adapt these ice-cream biscuits as you will sweet reader. Alternatively you can just make either the biccies or ice-cream.